Keeping kitchen counters and cabinets uncluttered can be a challenge. Under-cabinet storage systems provide a space-saving solution, allowing you to utilize the area above your counters. This type of storage also makes frequently used items easily accessible. Under-cabinet stemware storage is ideal for households where wine is enjoyed on a regular basis. 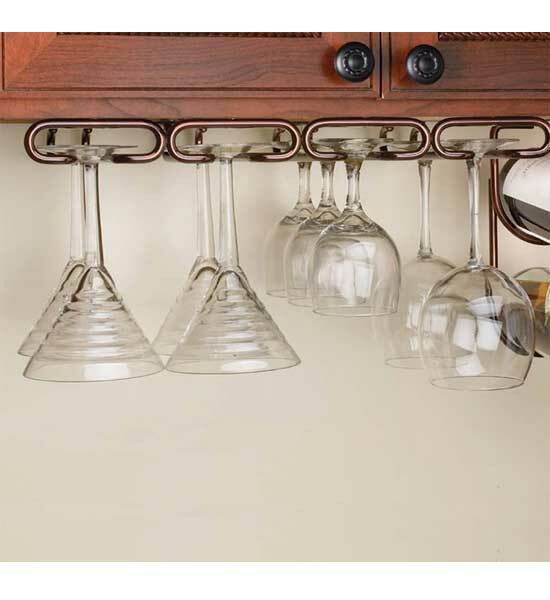 The Under Cabinet Stemware Rack is designed to hold a variety of stemware shapes and sizes, from wine goblets to martini glasses and champagne flutes. Featuring a unique mounting plate that permits easy installation on the bottom of frameless or framed cabinets (using just four screws), it’s available in three different finishes. Another easy-to-install system is the chrome Under Cabinet Wine and Stemware Rack, which can hold six bottles of wine in addition to six wine glasses. Under-cabinet knife storage lets you keep knives safely hidden away yet handy without sacrificing counter or drawer space. There are two kinds: the drop-down knife drawer that pulls down and angles towards you, with magnetic strips to keep knives in place; and the swing-out knife block with a 360-degree swivel (great for kitchen islands with overhead storage) and magnetized knife slots to hold knives securely. One crucial difference is that a swing-out block is visible whereas a drop-down knife drawer is hidden, designed to rest flush with the bottom of a cupboard. 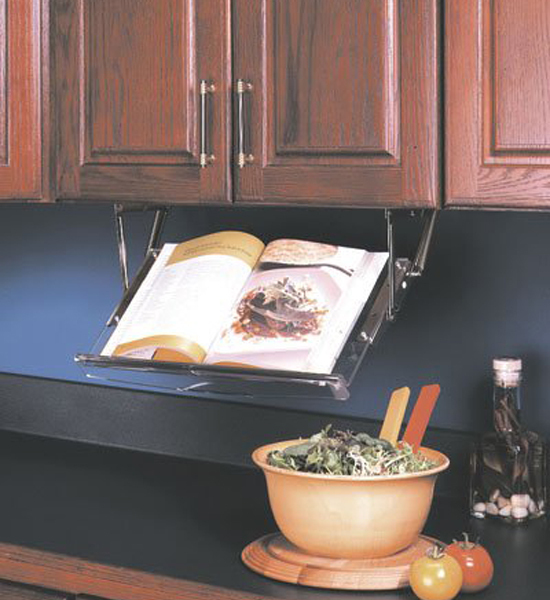 Under-cabinet cookbook holders offer a simple solution to the problem of where to keep the cookbook you need to refer to while you’re trying out a new recipe. The spring-loaded Under Cabinet Cookbook Holder makes it easy to instantly access a cookbook when and where you need it, then stores it out of the way under a cabinet when you’re done. It’s constructed of clear acrylic for complete invisibility. This entry was posted in Harriet's Blogs, Kitchen Organization and tagged cookbook holder, drop-down knife drawer, stemware storage by Harriet. Bookmark the permalink.